First, a caution: Many aculeates require considerable skill and experience in order to determine the correct species. To overcome these difficulties, BWARS runs frequent workshops to help members learn how to identify the various groups of aculeates. Key works that help with the determination of species are listed below. There are a small number of species that can be determined reasonably easily by beginners, and details of some of these species are given here. For identification advice please use iSpot (rather than this site) where helpful advice from experts (many of whom are BWARS members) is usually available. Listed here are the key works you can use to help you identify British aculeates. Some texts may be out of print, but are sometimes available as used books. 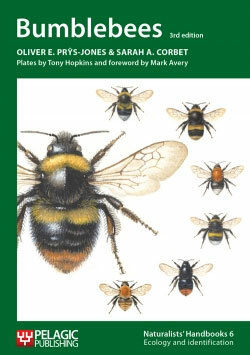 BWARS member Steven Falk's much anticipated Field Guide to Bees of Great Britain and Ireland has been published. This is the first extensive guide to all the British and Irish bee species since Edward Saunder's 1896 tome - The Hymenoptera Aculeata of the British Islands. The new field guide is 432 pages, with keys, species accounts and many photographs of nearly every species. In addition there are many illustrations by renowned insect illustrator Richard Lewington. Baldock, D.W., (2008) Bees of Surrey. Surrey Wildlife Trust. Although not primarily an identification guide, BWARS member, David Baldock's book contains a very helpful key (by another BWARS member Graham A Collins) to the genera of bees found in Britain. In addition, the species accounts often include helpful pointers on identifying individual species. Else, G. (1999). Identification - Leafcutter Bees. British Wildlife, Vol 10, Number 6. pp 388 - 393. Contains a key to all eight species of British Megachile. BWARS members Rhian Rowson and Mark Pavett have made this easy to use guide to the Coelioxys cuckoo-bees available for download here. Pesenko, Y. A., Banaszak, J., Radchenko, V. G. & Cierzniak, T. (2000) Bees of the Family Halictidae (excluding Sphecodes) of Poland. Wydawnictwo Uczelniane Wyższej Szkoły Pedagogicznej w Bydgoszczy. A useful book that covers all the British species of the genera Halictus & Lasioglossum. Text in English. The keys in this book need to be treated with some caution. Amiet, F., Herrmann, M., Müller, A. & Neumeyer, R. (2001) Apidae 3: Halictus, Lasioglossum. Fauna Helvetica 6. CSCF/SEG. Amiet, F., Herrmann, M., Müller, A. & Neumeyer, R. (2004) Apidae 4: Anthidium, Chelostoma, Coelioxys, Dioxys, Heriades, Lithurgus, Megachile, Osmia, Stelis. Fauna Helvetica 9. CSCF/SEG. Amiet, F., Herrmann, M., Müller A. & Neumeyer, R. (2011) Apidae 5: Ammobates, Ammobatoides, Anthophora, Biastes, Ceratina, Dasypoda, Epeoloides, Epeolus, Eucera, Macropis, Melecta, Melitta, Nomada, Pasites, Tetralonia, Thyreus, Xylocopa. Fauna Helvetica 20. CSCF/SEG. Amiet, F., Herrmann, M., Müller, A. & Neumeyer, R. (2011) Apidae 6: Andrena, Melitturga, Panurginus, Panurgus. Fauna Helvetica 26. CSCF/SEG. Bumblebees are a well covered group, with several useful guides available. With the wide availability of identification guides, bumblebees are a popular group for beginners to start with. Edwards, M. & Jenner, M. (2009). Field Guide to the Bumblebees of Great Britain & Ireland. Ocelli Ltd. This is an excellent guide that is easy to use and to carry in the field. It contains a quick colour pattern key to UK species, plus colour photos of all the UK species. Prys-Jones, O. E. and Corbet, S. A. (2011 - revised edition). Bumblebees. Pelagic Publishing. Another small and easy to carry book. Perhaps not as easy to use in the field as Edwards and Jenner's book, but still a very useful guide. Contains full, illustrated keys. Benton, T. (2006) Bumblebees, Collins New Naturalist Library: 98, Harper Collins. Contains an excellent key to, and descriptions, of British bumblebees. Warwickshire's Bumblebees by Steven Falk (2011), available as free download from this website, contains many excellent photographs and identification tips for most British bumblebees. Steven Falk has also made an extremely helpful Bombus section on his Flickr pages. This includes many images and helpful field identification hints for 23 of the 24 UK species. Perkins, J. F. (1976). Hymenoptera Bethyloidea (excl. Chrysididae) Handbooks for the Identification of British Insects, 6 part 3a. Royal Entomological Society. Day, M. C. (1988). 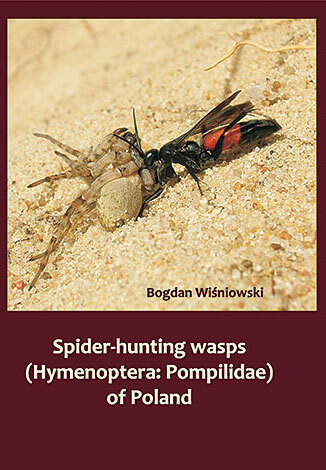 Spider Wasps - Hymenoptera: Pompilidae. Handbooks for the Identification of British Insects 6 part 4. Royal Entomological Society. Richards O. W, (1980). Scolioidea, Vespoidea and Sphecidae. Handbooks for the Identification of British Insects 6 part 3(b). Royal Entomological Society. Some nomenclature has changed since publication, but still an important key for British aculeate wasps. Archer, M. A. (2014). The Vespoid Wasps (Tiphiidae, Mutillidae, Sapygidae, Scoliidae and Vespidae) of the British Isles. Handbooks for the Identification of British Insects, Volume 6, Part 6. Royal Entomological Society. Has well illustrated keys and detailed species accounts. There are colour images of many species. Yeo, P. F. & Corbet, S. A. (1995). Solitary Wasps. Naturalists Handbooks 3. Richmond Publishing Co. Ltd. An excellent guide, with keys to most British aculeate wasps and colour plates illustrating a representative selection of the British species. Bitsch J. et al. (1993, 1997, 2001 and forthcoming). Hyménoptères Sphecidae d'Europe Occidentale Volumes 1-4. Faune de France. FFSSN. Text in French, but highly recommended volumes covering sphecid and crabronid wasps. Olmi, M (1994). The Dryinidae and Embolemidae (Hymenoptera: Chrysidoidea) of Fennoscandia and Denmark. Fauna Entomologica Scandinavica 30. Brill. A useful text for these very difficult families. Else, G. R., (1994) Social Wasps British Wildlife, Volume 5, pp 304-311. 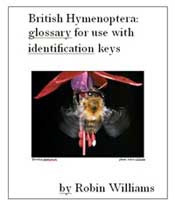 British Hymenoptera : glossary for use with identification keys. Price: £14 including post and packaging (UK). Wilmer, P. (1985). 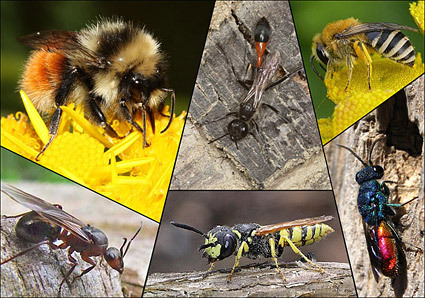 Bees, Ants and Wasps - A Key to the Genera of the British Aculeates. Field Studies Council. An Aidgap tested key. A useful key to genera of British aculeates. Skinner, G. J. & Allen, G. W. (1996). Ants. Naturalists Handbooks 24. Richmond Publishing Co. Ltd. Contains keys and plates to help identify most species of ant found in Britain. Bolton, B. & Collingwood, C. A. (1975). Hymenoptera, Formicidae. Handbooks for the Identification of British Insects 6 part 3c, Royal Entomological Society. A little out of date with some species missing. Czechowski, W., Radchenko, A. & Czechowska, W. (2002), The Ants (Hymenoptera, Formicidae) of Poland. MIZ. A useful guide in English, but the keys to male Lasius are omitted! Seifert, B. (2007). Die Ameisen Mittel- und Nordeuropas. Lutra, Klitten. In German with excellent keys, drawings and photographs. Collingwood, C. A. (1979). The Formicidae (Hymenoptera) of Fennoscandia and Denmark. Fauna Entomologica Scandinavica 8: 1-174. In English. East to use keys and drawings. A little out of date with some species not covered. Test keys and other identification resources are available as free downloads on the Identification guides page.